IANR Harlan Vice Chancellor Mike Boehm addresses a large group gathered at Haskell Ag Lab for a climate and crops family field day. Lincoln, Neb. — Over 400 Northeast Nebraskans converged upon the University of Nebraska–Lincoln’s Haskell Agricultural Laboratory near Concord on Aug. 14 for a climate and crops family field day. 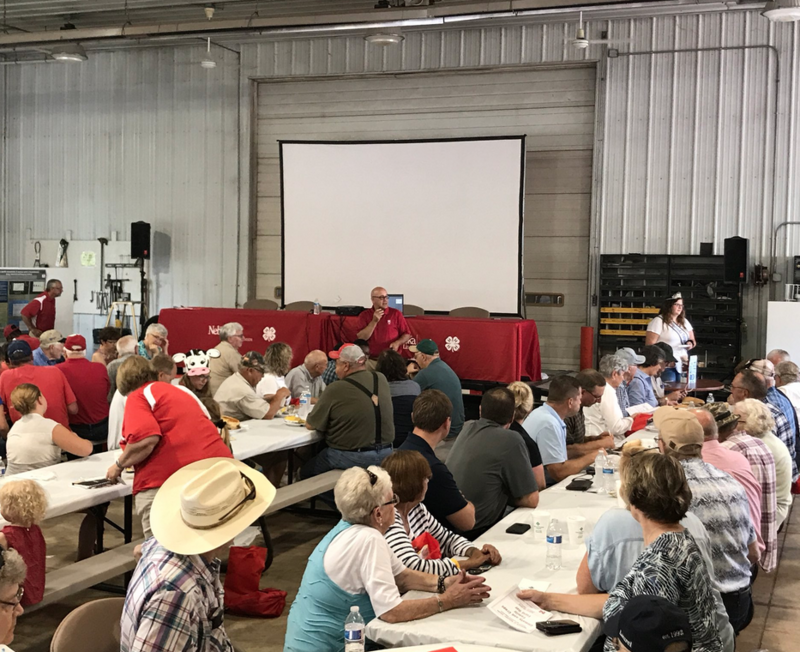 “This field day is what our university is all about,” Mike Boehm, University of Nebraska Vice President for Agriculture and Natural Resources and Harlan Vice Chancellor for the Institute of Agriculture and Natural Resources, told the large crowd gathered for lunch sponsored by the Nebraska Soybean Board. Boehm addressed the mission and vision for Haskell Ag Lab, which is being driven by grassroots conversation he and other university administrators continue to have with the 217,000 people that live in Northeast Nebraska. “Your passion for Haskell is evident by the great turn out today, and in the discussions I’ve had with many of you in recent months,” Boehm said. Attendees at the field day included youth, industry professionals, producers and others looking to learn more about current activities being conducted at the lab. Informational sessions from Nebraska Extension experts were focused on a wide range of topics, including heat stress in livestock, climate change on insects in Northeast Nebraska, climate trends and projections, Nebraska farm real estate and the 2018 Farm Bill. Popular activities for youth included Nebraska Extension’s Mobile Beef Lab, science literacy trailer, shooting sports trailer, water lab and a maker space exhibit. Extension has partnered with Beyond School Bells and several Nebraska school districts to develop the maker space exhibit, which allows youth to tinker, explore and problem-solve while helping to promote long-term sustainability for rural afterschool and summer programs. Walking tours of the Northeast Arboretum were offered throughout the day, along with instant pot demonstrations and safety demonstrations from Northeast Public Power district. Panelists from the popular lawn-and-garden television series “Backyard Farmer” were also on hand for a live question and answer session. To learn more about the Haskell Agricultural Laboratory, visit https://extension.unl.edu/statewide/nerec/.